"As was expected, after the election the feel good feeling has GONE WITH THE WIND. Based on Bursa historical growth rate I think Bursa will only top at most 1800-1850 by year's end (with the former more likely). 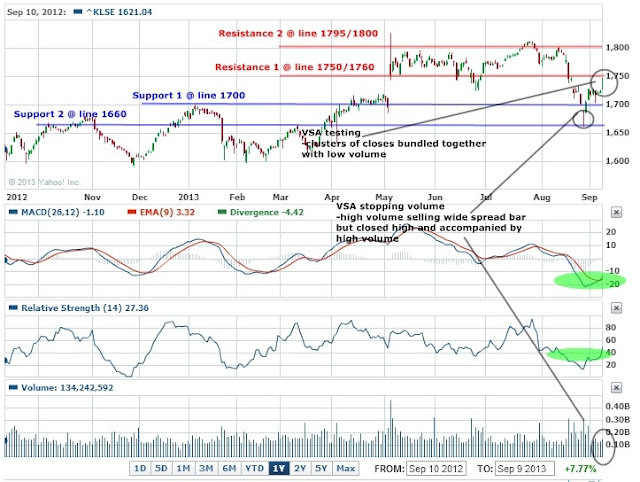 Thus as mentioned in the previous month, "the rest of 2013 will a be TEST OF PATIENCE for many investors: retail and institutional". Since BN won re-election with rather dubious voting results market is not going to be THAT excited as there is nothing new to expect. 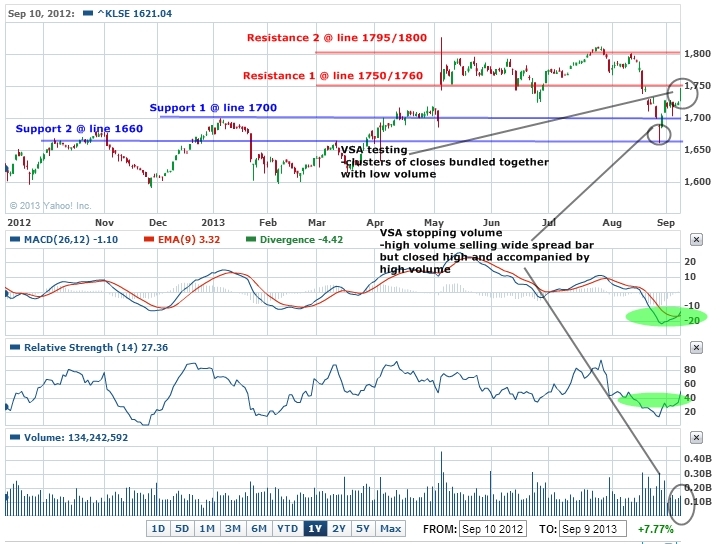 I am setting two support lines @ 1700 followed by 1655 and resistance at 1795." My thoughts remained UNCHANGED. However the recent correction has presented a decent buying opportunity and this is why I am going to load my portfolio with AmDynamic Bond as well as Parkson soon. Second my portfolio increased in value by ~RM10k. This is mainly thanks to Supermax which has finally shown it's true value while I achieved a 'durian runtuh' from BSDREIT as it is going private at RM2.10. Genting has yet to shine and is sadly one of my longest holdings to date. Staying true to fundamentals, I am still putting it as a BUY rating. As usual AMP Capital has good piece of information (freely available, no sign ups) on weekly global market & global economic update. It is usually updated every Monday afternoon so go read it when you have the time. This month's major highlights would be the US Fed meeting in Sept 16-17 as well as the Syria-eh crisis which might spillover into a regional conflict. *Genting: Final Dividend of 4.5 sen less 25% tax. *Freight: First Interim Dividend of 1.5 sen.
*BSDReit: Interim Income Distribution of 4 sen.
#1 Supermax changed from BUY TO HOLD status. #3 Have chosen to add AM Dynamic Bond into my portfolio since subscription has REOPENED! #4 I am looking to add one more this week. Big chances it will be PARKSON, I just have to run through some numbers and catch up on company's news/events and announcements..